This book is about General Walker and the end of his "Pro-Blue" Program in West Germany while Walker was in command of the 24th Infantry Division. 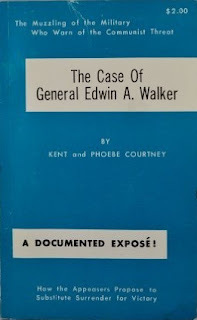 The liberal media of the time smeared General Walker and tried to make him out to be a right-wing nut. Eventually, Walker resigned his commission from the U.S. Army, the only general officer to do so in the 20th Century. Unfortunately, the book is poorly organized and manages to go off on tangents in places. A better edited and more focused book would have served the purpose much better of explaining the need for the Pro-Blue program and would have provided a stronger argument that the general was railroaded. As it is, this book serves best as a primary source for anyone researching this highly-decorated officer, a soldier who was the only other person we know of that Lee Harvey Oswald took a shot at in a failed assassination attempt that preceded Kennedy's.